Day 20: Success ... and Sharks! Being the chief diver is not all about being in the water. Being the chief diver is about everyone else's equipment and getting them in and out of the water safely. I love my job! 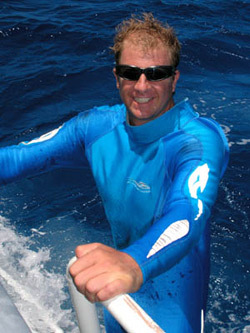 At 5 p.m. on Day 20, the team arrives at the farthest point in their journey, Kure Atoll. A joyful Jean-Michel states, "Arriving at Kure has been our dream, our goal, and finally the mission is coming true." Wasting no time, within hours they are in the water for a night dive, their first dive at Kure, and they are immediately rewarded for their long journey. 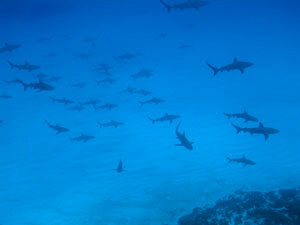 On this first dive they see more than 50 Galapagos sharks, attracted to the fish that follow their lights. A second dive, which lasts until 2 a.m., reveals even more -- hundreds of feeding sharks as well as a curious monk seal that tags along with the team. On the Day of Victory, no one is tired. The closed-circuit rebreather can triple a diver's bottom time. To be faced with the challenges of coordinating 11 divers on a daily basis. To be pushed to the limits of one's energy, alertness and positive attitude under harsh conditions. In reality, what is really good is when Jean-Michel and Don say it's good. Having to return to the surface. Snorkeling at the back of the boat by myself only to be surrounded by 50 Galapagos sharks. I love you, Mom!!!!! There is no cinnamon bear on board. Spicy because of the different attitudes and personalities. Rest is a must. For me, rest comes only when I go to bed at night. Most nights my bed is located on the flybridge. It's the highest point on the ship, and it's the biggest bedroom on board. I love it up there. You can look over the whole ship, plus it takes a lot of energy to get up there, so you know after a long day it's usually empty, even though it's a common area. It's my favorite place on the ship, hands down! Dolphins in the shallows in Midway; fresh oxygen and Sofnolime; looking out of the corner of your Supermask and seeing 20-plus sharks.